I need a quality mayo that performs in multiple dishes in my busy kitchen. The thick and creamy texture of HELLMANN'S Real holds up and won't split under pressure. Spoonable Dressing, with a variety of uses. Made with Real ingredients like egg yolks, lemon juice and vegetable oil. 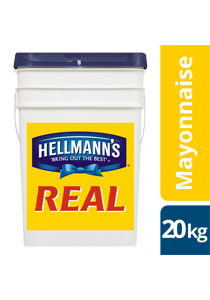 HELLMANN'S Real Mayonnaise is thick, rich and creamy, with a well balanced savoury profile, a hint of mustard and refreshing tang. Weight - 20 kg. Weight per serving/portion - 20 g.
A source of Omega 3.